I sent out the summer issue of my newsletter a few days ago, and one of the stories inside gave an overview of the recent experiments in paper sizing. In the story I mentioned how I had had trouble obtaining a brush to do this job - none of the brush makers still in business were willing to make a full-size brush for me, as this is pretty much a defunct business. But look at the email that showed up yesterday - from Richard Steiner in Kyoto! But the reason I am writing now is that you said you could not find a wide enuf brush, so you have to cut your sheets in half. Many years ago, I visited a paper-making village in northern Shikoku (forget the name now, but they are good and inexpensive; many families doing the paper making, a similar arrangement as we find in Etchizen). We stayed overnight, so got to know nearly everyone there. In this town there was a sizing kobo, a large scale operation. On the day we were there, they has just received delivery a couple days earlier of a sizing machine which they had designed and had make somewhere. They were testing it out. A long machine, nearly fully automatic. Very cleaver design, with sprayers located above and below the moving sheets of washi. One man loads the hamper at one end, and another man (could be the same man) removes the sized paper at the other end. Anyway, in another part of the building was where the traditional sizing was carried out. I saw a brush that had been thrown away and asked about it. Because the handle had split, it was too difficult to use. I asked if I could have it to use as decoration for my studio. OK, he said. And so it has served that function for many years. 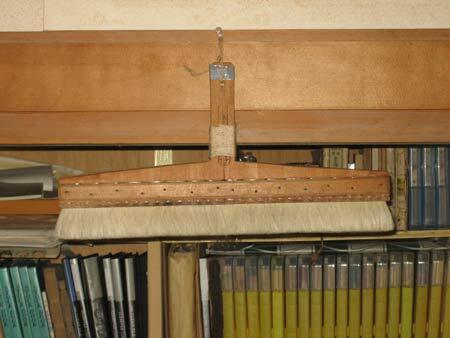 But after reading your article, I thot that perhaps the brush would like to go back into service. I had already wrapped cord around the split, and so solved the initial problem. (Why they hadn’t thot of this, I don’t know.) Here are some photos of the brush. It is about 42 cm wide. If you think you can use it, I will mail it to you. Try it out. If it works, keep it. If it does not work, send it back to resume being a room decoration, or you put it up on your wall as an objet. It was a dedicated sizing brush, so I am sure the hair and its thickness are correct. Let me know if you would like to try it. There is good news and bad news about the brush. So this certainly looks like a 'keeper'! Untreated, this is a deal killer. No way can we have active mold present in our brushes, either the ones for printing, or for sizing. The prints would never have a chance for long-term survival. So I'm going to prepare a formaldehyde bath, and put this thing under to soak for a while. I'll then remove all the visible mold, soak it more, dry it off, then repeat. I'm sure I'll be able to get rid of the visible mold; the danger will be in what is left up at the roots of the hair mass. I'm basically asking why you would spend extra time in a busy life having to size your papers?? Sure there are sized papers on the market, but 1) they are not suitable for my work, and 2) many of them have probably been sized by the same man who did my sizing until I started doing it myself (partly because he is near retirement, and has no successors). As mentioned in Richard's email above, there are industrial processes for sizing available, and this will become 'industry standard' once the final craftsman retires. The problem with that method, for people like me, is that you get a 'one size fits all' (literally) result - not suitable for my type of work at all. As I wrote in this story, I really do not want to be doing this myself ... but simply I have no choice.